4 PLATES PER PACK. Available in bulk quantities for upscale parties, wedding receptions and many special events. SIZE DIMENSIONS: 13 inch diameter (33cm) charger plate. Fits standard 9-inch plates and 10 inch plates. For decorative purposes only. Not for direct food contact. Not made from real wood. RENTAL QUALITY. Made of acrylic with a faux wood design. Each plate is made thick to resist breakage. Safely holds dinner plates, luncheon plates, and dessert plates. 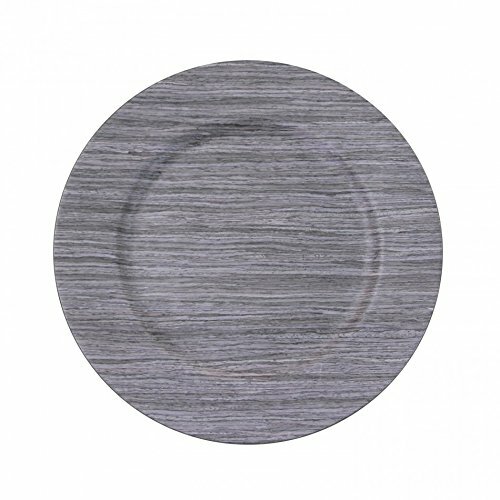 DECOR IDEAS: Add natural touch to your table with our faux wood charger plate. Use for tablescapes, geode wedding ideas, geometric wedding ideas, botanical centerpiece ideas, gem wedding ideas, simple agate gem stone ideas, geometric home decor, industrial minimalist decor, modern minimalist decor, stylish gray, black and gold ideas and more! EASY CARE AND STORAGE. Simply wipe clean with damp cloth and store in a dry room temperature area.